Growing up in the South, my youth was filled with stories of the Prohibition Era. I heard all kinds of wild tales of smuggling, daring chases through the backwoods, gangsters, late night raids, and shootouts. I don’t know how many of these stories were true or, like any good fish story, greatly exaggerated, but I was riveted by the action and mayhem in these tales. When I heard there was a game set during Prohibition and dealing with the manufacture and sale of illegal whiskey, I was intrigued. Would it be possible to create a game that captured that era and all of its wildness? Would anything live up to the stories of my youth? Could this game hold my attention in the same way those stories did? I played 1919: The Noble Experiment (currently on Kickstarter) to find out. The goal of 1919: The Noble Experiment is to earn the most prestige points by manufacturing whiskey and then being the first to sell it to the pubs. So how, exactly, do you get those points? Read on. 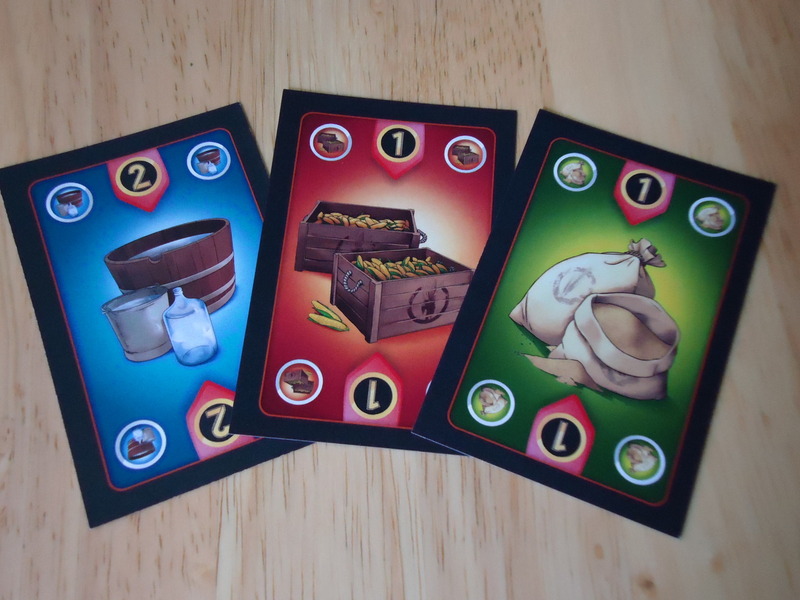 During set up, each player is dealt a hand of four basic workers (the starting player gets the Mayor card in place of one regular worker) and a specified number of ingredient cards, which varies with the number of players in the game. 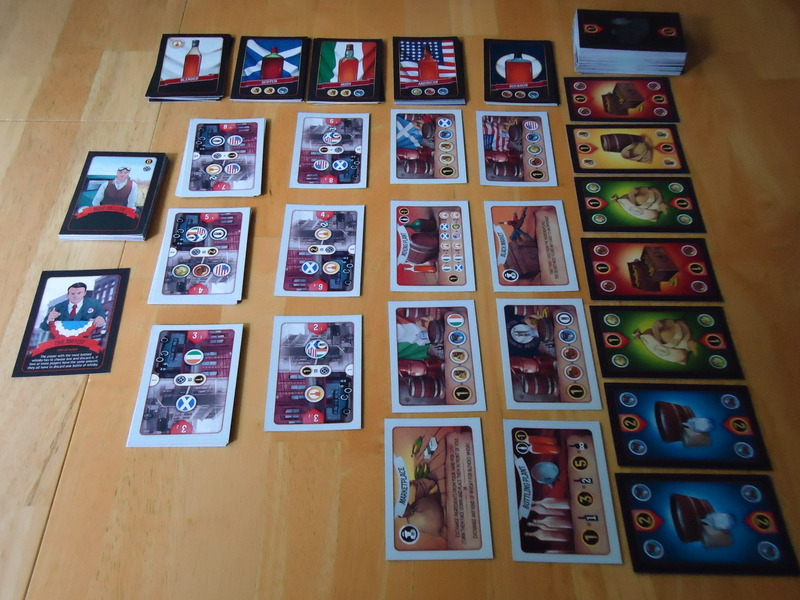 Three locale cards are also placed on the table, representing the first sales contracts available in the game. All set up and ready to play! Draw cards from the Market. You can draw two different ingredient cards (so, for example, one water and one corn), or you can take all the cards on display that are the same kind (so if there are four waters, you can take them all). Once you’ve drawn, you must select an ingredient card from your hand (it can’t be one of the cards you just drew) and pass it to the player on your left. That player must now discard one of their cards from their hand (it can’t be the one they just received). The Market is replenished back up to seven cards before the next player takes their turn. Use the buildings. 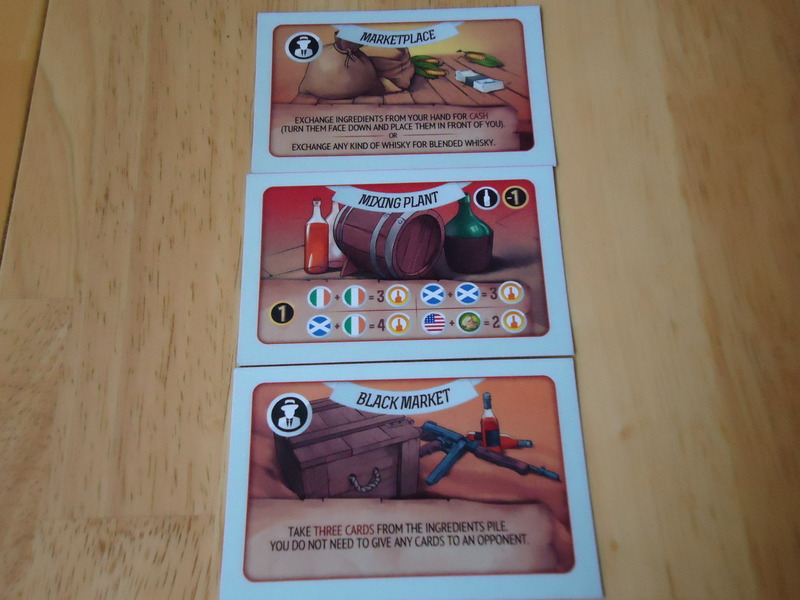 The buildings allow you to manufacture whiskey (Distilleries), bottle the whiskey you’ve made (Bottling Plant), transform your whiskey into blended whiskey (Mixing Plant), exchange ingredients for cash or trade regular whisky cards for blended whiskey (Marketplace), or take three cards from the ingredients pile without having to give any cards to an opponent (Black Market). You must pay the cost shown on the building and discard a worker in order to use it. (Some workers have special abilities which will discount the cost of using the various buildings.) The first time a building is used in a round, it is flipped over. It remains in play, but now it is more expensive for other players to use during the round. (It goes back to the cheaper value at the start of the next round.) You may only use one building per turn. Sell the whiskey. 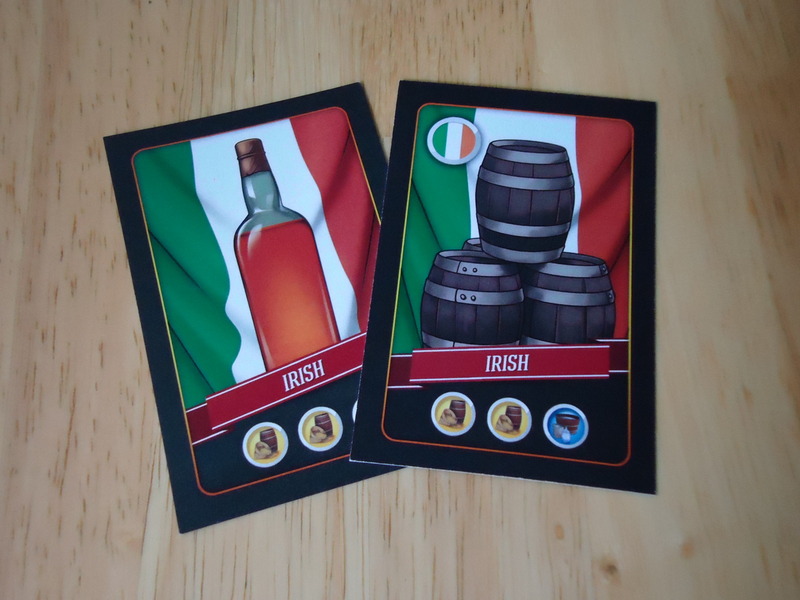 The locale cards represent contracts that you must fulfill in order to deliver whiskey to the pubs and earn prestige points. 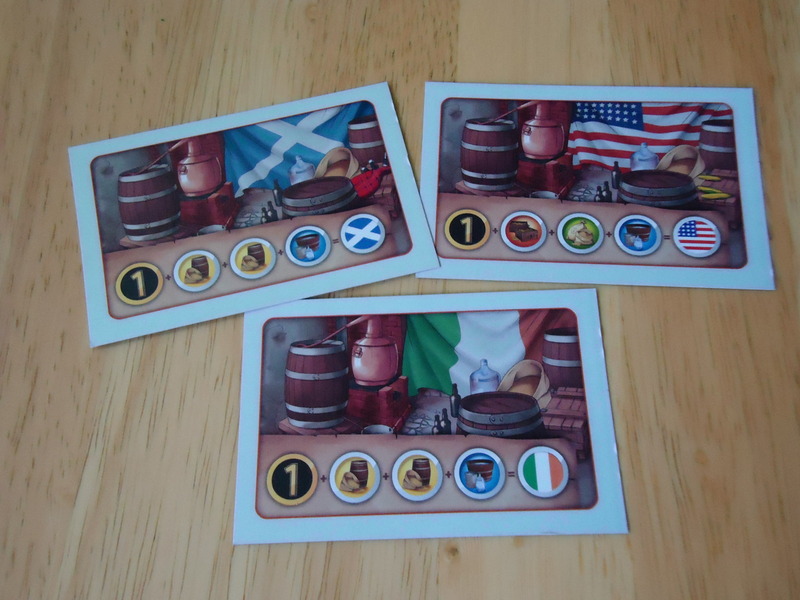 Each card shows which whiskey is needed, as well as how many workers and/or drivers are needed to complete the contract. When you have the required items and are ready to sell, you discard the required cards and take the locale card into your possession.The points shown are now yours. Use a worker’s special ability. If your worker’s special ability is labeled “Single Use,” you can use an action to invoke that ability instead of doing any of the other actions listed above. A round ends when one player discards his last worker. Before a new round begins, any locale cards that were completed and removed during the previous round are replaced. If a locale card was not claimed during the round, it is now flipped over to indicate that it is worth fewer points. A card can only be flipped once, so if another round goes by and the card is not claimed, it is removed from the game and replaced with a fresh contract. Players must also get new workers before a new round can begin but instead of being dealt four basic workers, a card draft allows players to buy workers with special abilities. 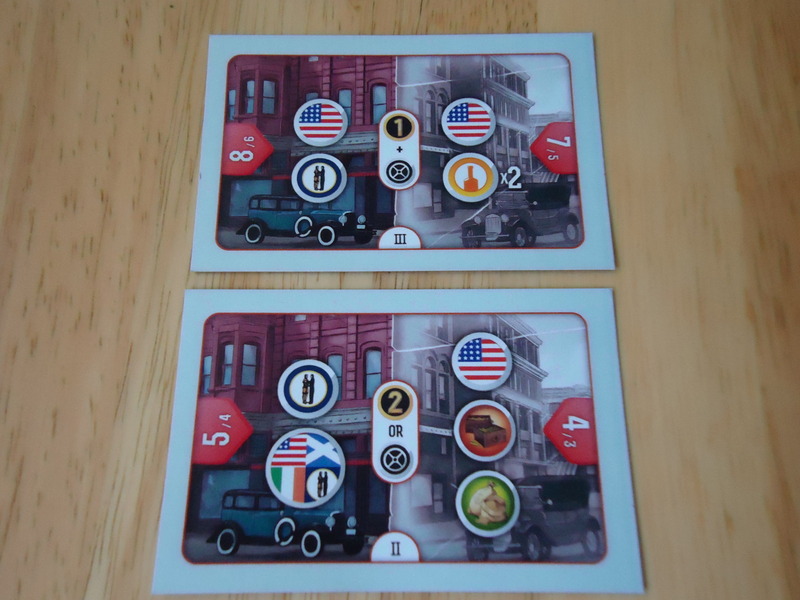 The first player takes two worker cards, looks at both and decides whether to pay for one of them. (If he can’t afford to pay, he can just take the basic, free worker who has no special ability.) He places the one he buys in front of him and passes the unchosen card to the next player. That player draws one additional worker card and then chooses his worker from those two cards. This repeats until all players have four workers. The game ends when you can no longer refill two of the three locale spaces from the decks. Players tally their prestige points and the person with the highest total wins. A tie goes to the person who has the most bottled whiskey. Home Brewed Fun or Prohibitively Awful? 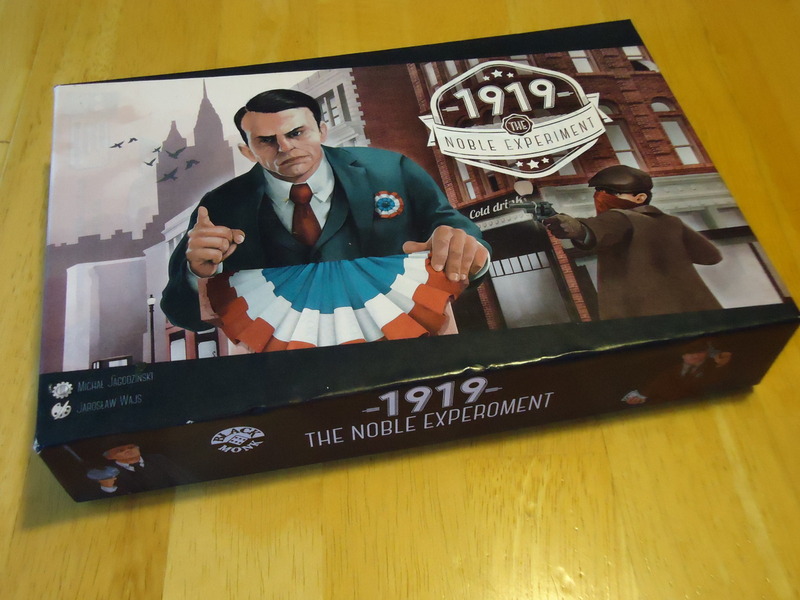 1919: The Noble Experiment seems like a simple set collection game at first. Get resources and then trade them to make whiskey, then trade the whiskey to fulfill a contract and get points. Easy and something you’ve seen a hundred times, right? Not so fast. The push-pull in this game comes from the fact that not only do you want to produce a lot of whiskey, you also want to do it quickly. The delivery contracts are worth more early in the game and then steadily decrease in value as the game progresses. Eventually, unfulfilled contracts are removed from the game and replaced with new ones. So if you aren’t making whiskey fast enough, you can watch that contract you have your eye on decrease in value or disappear from the game entirely. (Or simply be claimed by another player.) If it disappears, you may find that your work is now useless because no other contracts in play require what you’ve been collecting. Now you’ve got to start over and hope that your opponents do, too. The first round goes by quickly and without much drama. Since everyone is given the basic, free workers, there isn’t much to do besides buy ingredients and maybe distill a bottle of whiskey if you got a good first hand. Judged only by the first round, the game is a snore. Stick with it, though. Things get more interesting in the second round because if you managed your cash wisely in the first round, you can now buy workers that have special abilities. Depending on your worker’s abilities, you may be able to perform some actions for free or at a discount, produce extra whiskey, take extra cards, trade with or steal from an opponent, or make other players pay you cash. The abilities can make it much easier to advance your plans while also messing up those of your opponents. The card draft for buying workers adds an interesting twist because you’re never sure which workers you’re going to get to choose from. Will the one you rejected come back around again or will someone else have taken it? If faced with choosing between two desirable workers, which do you take and which do you cast aside? If you really want a certain worker, do you hoard your money hoping it will come around or do you assume that someone else will take it and go ahead and blow your money on less desirable workers? The player count changes the dynamics even more. With two players, you have a 50/50 chance that the discarded worker will come back to you. With more players, your odds drop so you have to choose wisely. Getting the workers with the abilities you need and then using them wisely is the key to succeeding at the game so the draft is important. Speaking of special workers, the Mayor Card also adds a few twists to the game. The Mayor can act as a good politician, or a slimy criminal (yes, there’s a difference). When you take control of the Mayor, you state whether you will use him as the Good Mayor or the Bad Mayor. The difference is in his special ability when played. If he’s the Good Mayor, the player with the most bottled whiskey has to choose one bottle and discard it. If he’s the Bad Mayor, every player has to pay the player controlling him $1 in cash. If they can’t pay, they have to discard one worker. The first is annoying. The second can completely doom your plans. The Mayor is then played to the player’s building of choice as a worker. When he’s used on a building, that building is now blocked and other players can only use it if they bribe the Mayor to go away, plus pay the cost of using the building. Bribing can be expensive but worth it because if you bribe the mayor, you get to take his card and you will control him in the next round. Almost everything in the game is known to all players. Workers are placed face up in front of the players so you can see who has which special abilities. You know who has the Mayor and whether they’re planning to use him as bad or good. You can see the whiskey that the other players have made or distilled, so you can make an educated guess as to which contracts they are going after. You can see how much cash they have in front of them so you know whether or not they can afford to pay off your Mayor, if you control him as the Bad Mayor, and you can get an idea of the what they can afford to buy. Having all of this information makes it possible to strategize. If everything was hidden, you’d just be playing a game of multi-player solitaire where you were each trying to compile hands of cards in a vacuum. But because you can know what your opponents are likely trying to do (and what they may do to you), the game becomes a richer, more strategic experience. It’s makes it a bit more like running a business where you kind of know what your competition is doing and you’re trying to outwit them, but you can still be surprised because they may pull something out of their hat that you aren’t expecting. Which brings me to the theme in 1919. The theme of bootlegging during Prohibition comes through, although not in the way you might imagine. When you think of Prohibition, you probably think of gangsters and mayhem, the same things that my relatives told stories about. But that’s not really the feeling you get from the game. 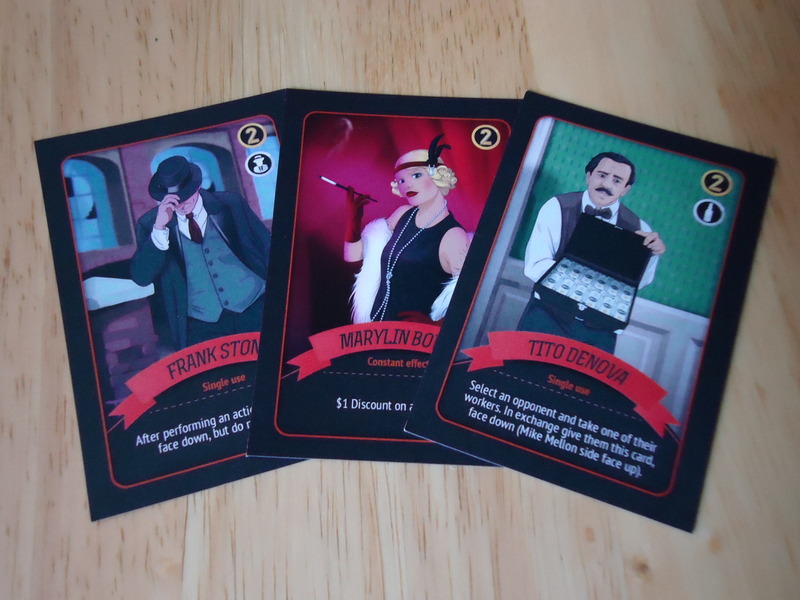 While you are supposedly the leader of a group of mobsters, it never really feels like that (This might change a bit if the publishers meet some of their stretch goals, as they will add some famous, “brand name” mobsters and locations to the decks). Some of the workers have “mobster-like” special abilities, but nothing really terrible happens in the game. The worst of it is that the Mayor can act as a law-abiding citizen or as a criminal and he accepts bribes. There is one worker that allows you to “eliminate” another player’s worker but if you want true mobster mayhem, you have to fill in your own blanks as to how that happened. On the plus side, this makes the game family friendly. There’s nothing scary or horrifying here, nothing that would be off-putting for kids or sensitive players (unless the whole theme of making booze upsets you, in which case you need to avoid the game entirely). There aren’t really any “consequences” for failing to deliver whiskey or double-crossing someone (no knee-capping or swimming with the fishes, for example), and there aren’t any police to come in and raid your illegal operation and send you to jail. However, the theme does shine through in other ways, you just have to adjust your expectations. 1919: The Noble Experiment is more of a business game. Although much simpler and smaller in scope, you could compare it to something like Dungeon Petz where the object is to gather resources, manage your workers, make the product, and then sell the finished product for the most points, making your buyers happy. Other players/business owners may get in your way and screw up your plans, but you are trying to run your business to make the most money for yourself. Taken in that context, the game is a good representation of the (illegal) business-end of Prohibition. Unless the theme of alcohol production is a problem for you, 1919 is a good choice for most gaming groups. There can be a bit of “take that” play or screwage if you use a special ability that directly takes something from another player, but it’s not constant or overly aggressive. Most of the “Aw, man” moments in the game come because someone else beats you to the contract you’ve been working toward or uses a building you wanted and makes it more expensive for you. If you’re watchful, though, and keep up with what your opponents are doing and which workers they have, you can see a good bit of this coming and try to plan for it accordingly. The game plays fast. We finished some games in as little as thirty minutes. Most are in the neighborhood of 40 – 50 minutes. Set up is a breeze once you’ve got all the card types separated. There’s little downtime and not much AP. Certainly there are opportunities for thought, such as when considering workers during the draft or deciding which is the best action to take (or the lesser of the evils, in some cases) but it will only become a problem if your group has “that person” who has to overthink everything. In most cases, decisions aren’t that hard to make. The artwork is quite good, if not earth shaking. I had a prototype copy so the art may not be final, but Black Monk is definitely on the right track. It’s colorful, easy to tell which card types are which, and the worker cards are evocative of the time period and personalities. The copy I had definitely wasn’t using final card stock, so I can’t comment on the sturdiness of the cards or whether you should expect to sleeve or not. Since the cards get minimal shuffling, sleeving probably won’t be necessary. In the prototype version of this game the only problem area was the rules. 1919 is ultimately a fairly simple and fast game. Once it clicks, it’s easy to see how all the parts work together to make a smooth play experience. However, it takes a couple of plays to get there and the rules don’t help that. They aren’t terrible, just in need of polishing and some clarifications. During our first plays there were a few clunky moments of, “Wait, how do you do that? Don’t know. The rules don’t really say.”(Or the rules did say, but on a different page from where the issue was originally detailed.) Hopefully the final version will improve the rules and allow 1919 to shine the way it should. Did 1919: The Noble Experiment capture the Prohibition Era that I grew up hearing about? Not really. Compared to the tales of my youth, the game was quite tame. There were no shootouts, midnight raids, or crazy car chases through the backwoods. However, the game did do a good job of capturing the process of running a business that makes and sells illegal whiskey. I found that interesting because that’s not the part I grew up hearing about. Business (illegal or legal) doesn’t often make for stories that can entertain the grandchildren, after all. But it does make for a pretty good game. 1919: The Noble Experiment is currently seeking funds on Kickstarter. The project will run through Saturday, October 11th. If you’re interested in getting a copy of the game for yourself, head over to the campaign page and make at least a $29 pledge, which includes U.S. domestic shipping.